So if you’re on a diet, I apologize for the temptation. 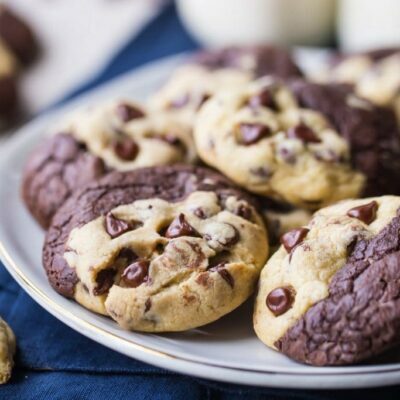 You can always bake them and taste them and gift the rest of them away. 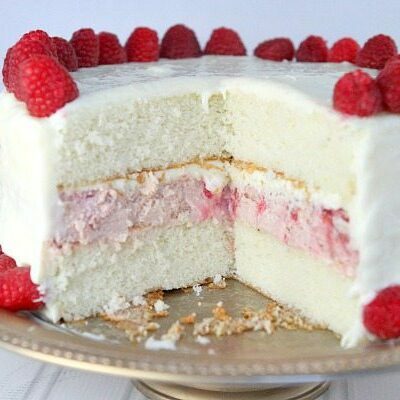 I do pretty well with them when they’re stored in the freezer… they’re out of sight and I seem to be able to keep them out of mind too when they’re not sitting on my counter overtly teasing me. 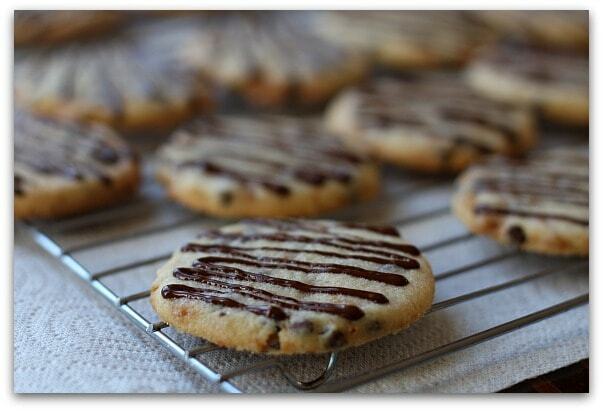 They’re a simple little toffee & chocolate chip infused cookie rolled into a ball and squashed with a sugared glass. 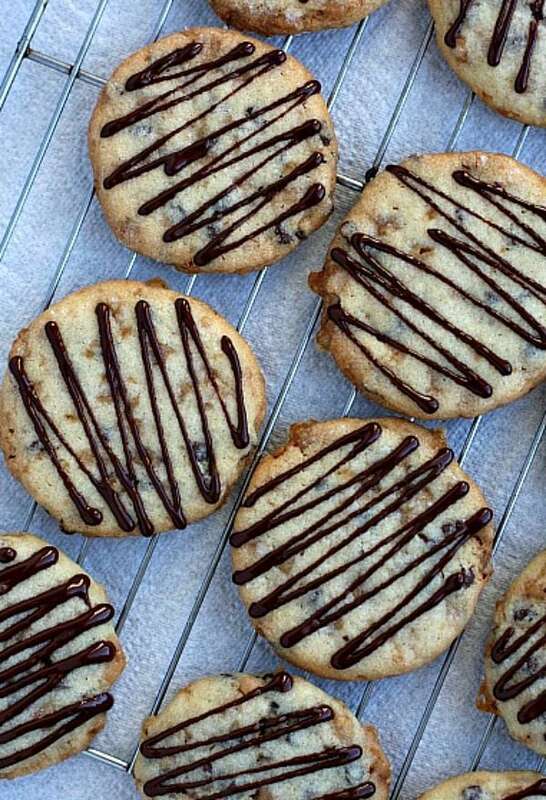 These toffee- chocolate chip cookies themselves are a keeper. I could have sat and eaten a dozen of them with a big glass of milk for dunking. But they aren’t quite done yet. They need a quick drizzle of chocolate. 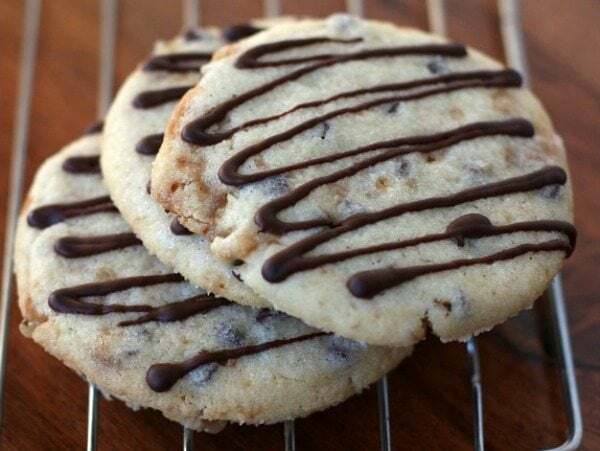 The chocolate turns these toffee- chocolate chip cookies into candy bar cookies. I love the combination, and the drizzle makes them look pretty too. 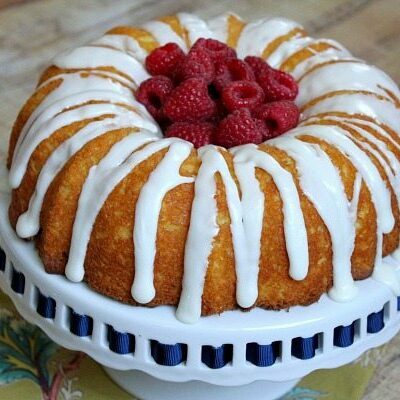 In a large bowl, use an electric mixer to cream butter until pale and fluffy (1 minute). Add in sugars and beat until well combined. Add in egg and vanilla; beat until mixture looks smooth. Add flour; beat until just incorporated, scraping down sides of bowl. Stir in chocolate chips and toffee bits. Gather dough into a ball and refrigerate for an hour or so until dough is slightly firm. 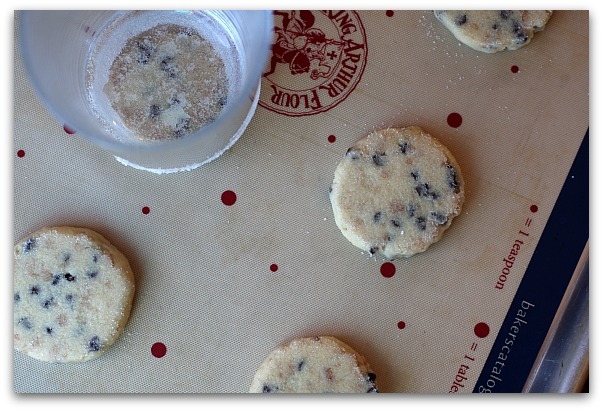 Preheat oven to 350 degrees F. Line baking sheets with parchment paper or silpat mats. Roll dough into 1-inch balls; place 2 inches apart on prepared baking sheets. Dampen the flat bottom of a glass cup and dip in sugar. Use the sugared bottom of the cup to press each ball firmly into a 2-inch round. You may need to re-dip the glass in sugar now and then to keep from sticking to the dough. Bake 11 to 13 minutes. 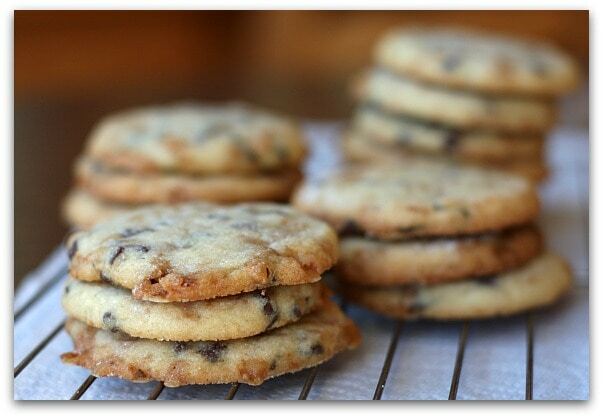 Let cookies cool. In a small microwave-safe bowl, microwave the chocolate on high for 20 seconds or so, until partially melted. Stir until smooth. Scoop into a small zip baggie, zip closed and snip and very small piece off of the corner of the bag. 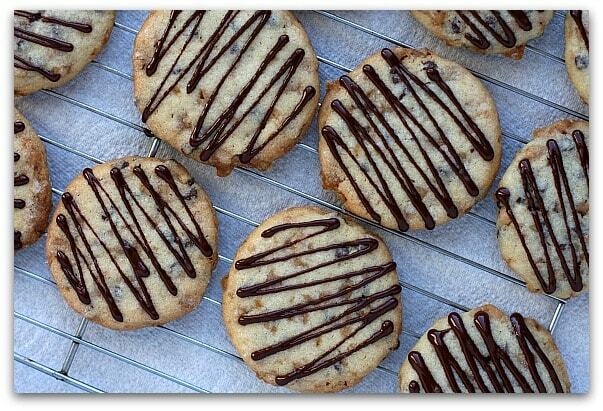 Squeeze the bag and drizzle lines back and forth across each cookie. Let sit at room temperature until chocolate is set. 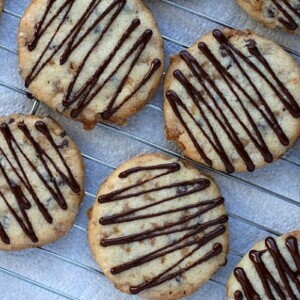 Cookies will keep at room temperature in an airtight container for up to one week or in the freezer for up to 6 months. A Crockpot Recipe... and it's GOOD! The chocolate drizzle looks amazing!!! Can’t wait to give these a try. Thanks for the recipe!! OK, I’ve SOOO got to try these and blog about them. That Chocolate drizzle looks absolutely beautiful. 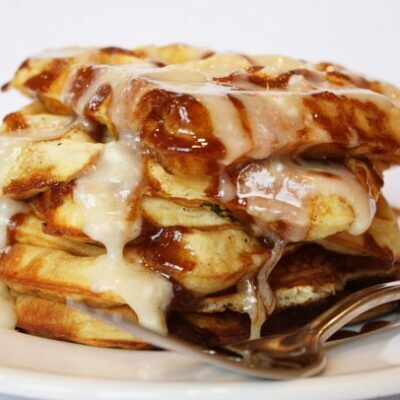 Imagine adding White Chocolate drizzle lines too! I’m not much of a cookier baker or eater but these sound righ tup my alley!